After a 19-year-old cheerleader from Texas sparked a firestorm of criticism for posting grisly photos onto Facebook of animals she killed for fun in Africa, the social media giant is apparently cracking down on other hunting photos -- and stories -- as well. At around midday on Sunday, article_d2ded432-0214-11e4-bad0-001a4bcf6878.html?mode=story">the Lancaster Online, a news outlet covering southern Pennsylvania, shared an article on their Facebook page about a local eighth-grader's recent hunting trip in Canada where she, along with her father, shot and killed a bear with her crossbow. The post included a photo of the young hunter, the 12-year-old daughter of Chad Hohenwarter, posing along with the dead animal he encouraged her to kill. By four o'clock that afternoon, Facebook had deleted the post -- and for good reason. For the past few years, Chad has taken along his daughter as he ventured out to shoot animals for sport, though she only had experience shooting at paper targets at home. Last fall, however, while out on one of his hunting trips, Chad suggested she take a shot at a real-live buck with her crossbow. She wasn't eager, but she did it anyways. "She said, ‘Dad, do I have to shoot it?'" the girl's father recalled. "I told her she didn't. She didn't feel comfortable with the shot, and I'm glad she made the decision she made." Not long after, Chad says his daughter had the idea to go on a bear hunting trip across the border, so he made arrangements for them to go last month. 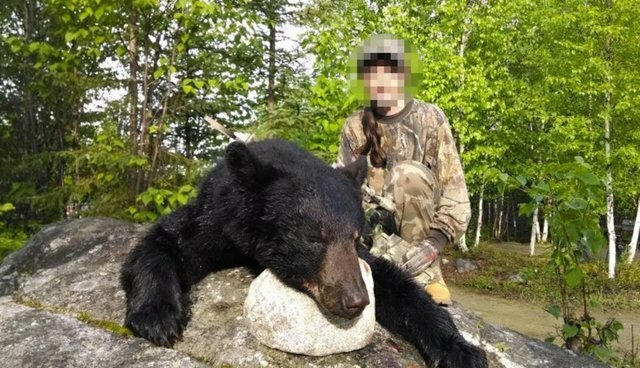 The girl had apparently become convinced, no doubt through the positive reinforcement of her parent, that killing animals wasn't a such a sad thing after all. "Bears are so cool," said the girl. "You hear about people shooting deer all the time, but you don't hear about girls shooting bears.'' And sure enough, after hiking deep into the remote forests of northern Quebec, she had the chance. On the third night of their trip, Chad and his daughter spotted a black bear -- lured in by bait they had left out to make finding their target virtually effortless. The girl says she was "scared", and seemed once again to hesitate taking its life. "I leaned over and I started to tell her to take the shot," says Chad. "But before I could get the words out of my mouth, she pulled the trigger." The wounded animal, struck by the girl's arrow, darted off in terror, only to fall dead moments later. "Bear hunting is so much fun,'' Emily said. "When I walked up to it, I was speechless. I just kept thinking, ‘I just shot my own bear!'" 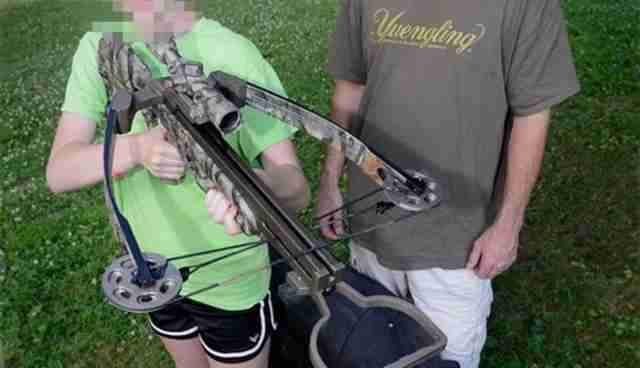 Chad plans to have his daughter's kill stuffed and mounted in their home. Trophy hunting, that is to say, hunting for amusement and mementos alone, is considered by some to be a family tradition, couched as wholesome way to connect with nature -- but there is nothing natural about killing for fun. In fact, those who take the life of animals for such indefensible ends aren't hurting their animal targets, they're actually hurting us all. Trophy hunting advocates tout the activity as a key form of conservation -- but in reality, it merely contributes to the gradual decimation of endangered species around the world. Join us in pledging never to support big game hunting of any form, and to stand with governments that ban the sale of imported animal "trophies."